What the pasture looked like before fencing. When Keogh started this demonstration, there were three distinct areas in the pasture. 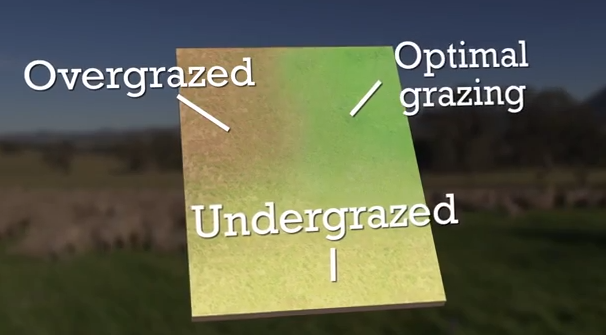 One area was under grazed, another was overgrazed and the last part was grazed just right. The problem was self-perpetuating. The under grazed area’s forage was tall and rank and unpalatable, so the sheep avoided it, which caused overgrazing in another part of the pasture. So the under grazed area was always under grazed and the overgrazed area was always over grazed. With fencing they could better manage the sheep’s movement through the pasture, and in no time forage use changed, the overgrazed area improved, and the under grazed area became more productive. Now all areas of the pasture are producing as much as the optimally grazed area. It’s a great 4 minute look at the benefits of rotational grazing, along with some good news for our readers in arid regions. It shows that you can make beneficial changes without lots of effort. It also shows something we don’t often see: video of 1500 sheep moving through a rotationally grazed pasture.